Our Engineer Grade Prestriped Barricade Tape is an economical and effective way to mark the end of a road, dead ends, hazardous areas and even vehicles. It is a vivid tape and is clearly visible at night because of its reflective properties. The tape is retro reflective meaning it concentrates light and returns it back to the source which in most cases are car headlights. Our engineer grade prestriped tape exceeds ASTM D-4956 Type 1 standards. This tape is available in either a left slant (L6) or a right slant (R6). The slant generally directs traffic either to the left or right. We have a separate article that goes over the MUTCD regulations governing barricade tape. The article also shows you when to use a left slant and when to use a right slant. Click here to view our article on barricade tape regulations. The image below shows each. As you can see, the slant starts at the bottom and goes either right or left. Also, the tapes are available in either a white/orange or a white/red. The 6 in L6 or R6 means that the stripes are 6″ wide. The stripes are placed at a 45 degree angle. Because of its unique look and design, reflective barricade tape is also used to mark items like dumpsters, containers, bollards, fences, gate arms, loading docks, heavy equipment, cranes and more. This product can be purchased online at the following sites. Reflective Tape Dealer or www.safety-tapes.com. Both sites are owned and operated by Reflective Inc. We have been in the reflective tape business since 1998. Our High Intensity Grade Type 3 Prestriped Barricade Tape is an economical and effective way to mark the end of a road, dead ends, hazardous areas and even the back, front and sides of vehicles. It is a type 3 glass bead tape and is approximately 3 times brighter than our engineer grade tape. This allows the tape to be seen from farther way. In areas where cars approach the tape faster or where there is some competitive lighting the high intensity tape would be seen before an engineer grade would be. Like all of our reflective tapes this tape is retro reflective meaning it concentrates light and returns it back to the source which in most cases are a cars headlights. This tape is available in a left slant (L6) or a right slant (R6). In general, the slant directs traffic either to the left or right. As you can see, the slant of the stripes starts at the bottom and goes either right or left. 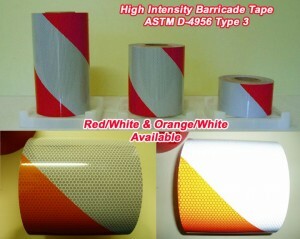 Also, the barricade tapes are available in either a white/orange or a white/red. The 6 in the designation L6 or R6 means that the stripes are 6″ wide when measured on the diagonal. The stripes are placed at a 45 degree angle. Because of its extra bright reflectivity and unique attention getting look, high intensity barricade tape is used in a variety of other applications. Items like construction equipment, cranes, concrete barriers, loading docks, earth moving equipment and more are often marked with this tape. This product can be purchased online at the following sites. www.colebrothers.com or www.safety-tapes.com. Both sites are owned and operated by Reflective Inc. We have been in business since 1998. The MUTCD regulation below regulates the type of barricade, colors and slant. In summary, work zone colors are orange and white. When a road terminates the colors are to be red and white. The slant of the material designates which way traffic is to go. A slant downward and to the left means traffic goes to the left. A slant downward and to the right means traffic should go to the right. Reflective material is called L6 or left slant if it slants upward to the left and R6 or right slant if it slants upward to the right. Note that an L6 material directs traffic to the right and a R6 material directs traffic to the left. (It is simply the opposite.) A type 1 barricade has one horizontal bar, a type 2 has 2 and a type 3 has 3. 01 A barricade is a portable or fixed device having from one to three rails with appropriate markings and is used to control road users by closing, restricting, or delineating all or a portion of the right-of-way. 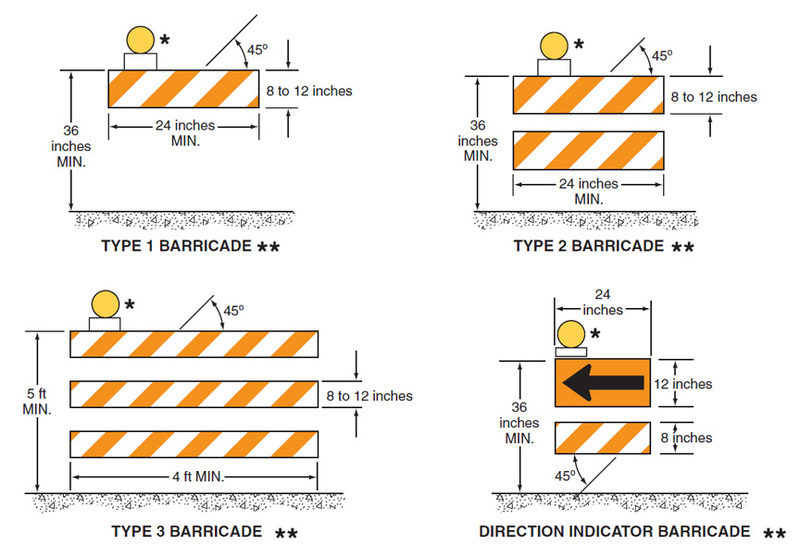 02 As shown in Figure 6F-7, barricades are classified as Type 1, Type 2, or Type 3. 03 Stripes on barricade rails shall be alternating orange and white retroreflective stripes sloping downward at an angle of 45 degrees in the direction road users are to pass. Except as provided in Paragraph 4, the stripes shall be 6 inches wide. 04 When rail lengths are less than 36 inches, 4-inch wide stripes may be used. 05 The minimum length for Type 1 and Type 2 Barricades shall be 24 inches, and the minimum length for Type 3 Barricades shall be 48 inches. Each barricade rail shall be 8 to 12 inches wide. Barricades used on freeways, expressways, and other high-speed roadways shall have a minimum of 270 square inches of retroreflective area facing road users. 06 Where barricades extend entirely across a roadway, the stripes should slope downward in the direction toward which road users must turn. 07 Where both right and left turns are provided, the barricade stripes should slope downward in both directions from the center of the barricade or barricades. 08 Where no turns are intended, the stripes should be positioned to slope downward toward the center of the barricade or barricades. 09 Barricade rails should be supported in a manner that will allow them to be seen by the road user, and in a manner that provides a stable support that is not easily blown over or displaced. 10 The width of the existing pedestrian facility should be provided for the temporary facility if practical. Traffic control devices and other construction materials and features should not intrude into the usable width of the sidewalk, temporary pathway, or other pedestrian facility. When it is not possible to maintain a minimum width of 60 inches throughout the entire length of the pedestrian pathway, a 60 x 60-inch passing space should be provided at least every 200 feet to allow individuals in wheelchairs to pass. 11 Barricade rail supports should not project into pedestrian circulation routes more than 4 inches from the support between 27 and 80 inches from the surface as described in Section 4.4.1 of the “Americans with Disabilities Act Accessibility Guidelines for Buildings and Facilities (ADAAG)” (see Section 1A.11). 12 For Type 1 Barricades, the support may include other unstriped horizontal rails necessary to provide stability. 13 On high-speed expressways or in other situations where barricades may be susceptible to overturning in the wind, ballasting should be used. 14 Sandbags may be placed on the lower parts of the frame or the stays of barricades to provide the required ballast. 15 Type 1 or Type 2 Barricades are intended for use in situations where road user flow is maintained through the TTC zone. 16 Barricades may be used alone or in groups to mark a specific condition or they may be used in a series for channelizing road users. 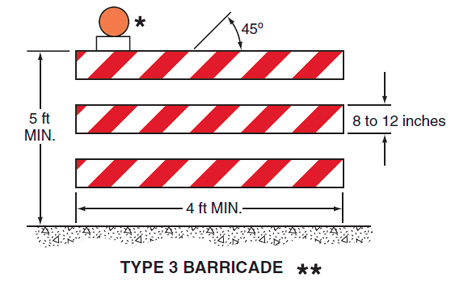 17 Type 1 Barricades may be used on conventional roads or urban streets. 18 Type 2 or Type 3 Barricades should be used on freeways and expressways or other high-speed roadways. Type 3 Barricades should be used to close or partially close a road. 19 Type 3 Barricades used at a road closure may be placed completely across a roadway or from curb to curb. 20 Where provision is made for access of authorized equipment and vehicles, the responsibility for Type 3 Barricades should be assigned to a person who will provide proper closure at the end of each work day. 21 When a highway is legally closed but access must still be allowed for local road users, barricades usually are not extended completely across the roadway. 22 A sign shall be installed with the appropriate legend concerning permissible use by local road users (see Section 6F.09). Adequate visibility of the barricades from both directions shall be provided. 23 Signs may be installed on barricades (see Section 6F.03). 01 The Direction Indicator Barricade (see Figure 6F-7) shall consist of a One-Direction Large Arrow (W1-6) sign mounted above a diagonal striped, horizontally aligned, retroreflective rail. 02 The One-Direction Large Arrow (W1-6) sign shall be black on an orange background. The stripes on the bottom rail shall be alternating orange and white retroreflective stripes sloping downward at an angle of 45 degrees in the direction road users are to pass. The stripes shall be 4 inches wide. The One-Direction Large Arrow (W1-6) sign shall be 24 x 12 inches. The bottom rail shall have a length of 24 inches and a height of 8 inches. 03 The Direction Indicator Barricade may be used in tapers, transitions, and other areas where specific directional guidance to drivers is necessary. 04 If used, Direction Indicator Barricades should be used in series to direct the driver through the transition and into the intended travel lane. C. The permanent or semi-permanent closure or termination of a roadway. 02 When used to warn and alert road users of the terminus of a roadway in other than temporary traffic control zones, barricades shall meet the design criteria of Section 6F.68 for a Type 3 Barricade, except that the colors of the stripes shall be retroreflective white and retroreflective red. 03 An end-of-roadway marker or markers may be used as described in Section 2C.66. 04 Appropriate advance warning signs (see Chapter 2C) should be used. Our Nikkalite® Pre-Striped Barricade (PSB) sheeting has alternating 6” stripes running diagonally at an angle of 45° and comes in orange/white or red/white rolls. The day and night (retroreflective) colors of the orange and red stripes are almost identical, resulting in a sharp contrast between the white stripes and the colored stripes, giving optimum target value. The material is coated with an aggressive, high-tack pressure sensitive adhesive that will bond well to most substrates used in the construction zone signing. The red and orange stripes are printed under the top film layer so the sheeting is scratch resistant.